The VLC team meets a new challenge with the release of Windows 8 and Windows RT operating systems. To support these platforms a new user interface needs to be designed and implemented. This is a major work which needs some kickstarting. To get the project going quickly funds are being raised using 'Kickstarter', which is a crowd funding website. To support developing VLC for Windows 8 User Experience ("Metro") follow this link. According to Wikipedia: "Real Time Messaging Protocol (RTMP) was initially a proprietary protocol developed by Macromedia for streaming audio, video and data over the Internet, between a Flash player and a server. Macromedia is now owned by Adobe, which has released an incomplete version of the specification of the protocol for public use." Letting gitolite, git-daemon, gitweb and SELinux play well together needs some careful thought. Although most of the hard work is already done you still need to tweak the permissions a little. Especially when the git repository is not stored under /var/lib/gitolite. In the following discussion I assume that the gitolite repository is installed under /home/git or /home/gitolite. In Prague (Czech Republic) the Multimedia Summit was held as part of the Kernel Summit. It was good to meet the developers of the Video4Linux subsystem in the Linux kernel. VLC uses the v4l2 interfaces (and libv4l2) for capturing from WebCams and any other capturing devices supported on Linux. The VideoLAN team visited LinuxTag again and shared its booth with our friends from Libav and XBMC. In contrast to last year our mutual stand was located in the first hall and not in the second. If you have not been to CeBIT 2011 in Hannover this year, then you missed the presence of the VideoLAN team there. What did we had to show? Many people wonder how vlc connects to an RTSP network camera (especially the Axis ones)? Well, the answer to this question is to use RTSP. What is this RTSP thing? RTSP is a application level protocol designed for controlling delivery of data with real-time properties. The data is such as audio and video either live or stored (video on demand). RTSP 1.0 is described in RFC 2326. It defines a way to start media resources on a server and typically uses port 554 to listen for incoming requests. Who said VideoLAN and VLC is only for guys and geeks? Judging from this picture you are clearly wrong. 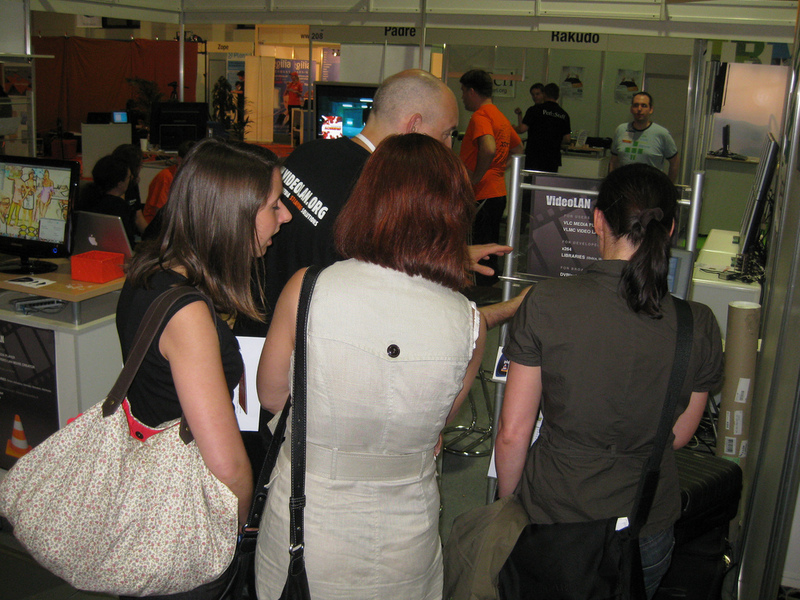 At LinuxTAG the VLC stand attracted women, just when Hugo left the boot. I am not sure that has any correlation though ;). Last week I was at LinuxTAG 2010 for VideoLAN. In contrast to other years we had some promotion material: stickers, flyers and posters. More then 600 people payed attention to our booth in four days of LinuxTAG. Several features of VLC where demonstrated: recording, playback and streaming. Thursday and Saturday one of the VLMC developer hugo demonstrated the current state of VideoLAN Media Creator. He got very good feedback from people and they could not wait to give it a try. I was recently looking at some interesting Formula One photography and came upon this picture. Copyright © 2019, Jean-Paul Saman.